- The root ai- j becomesay- in the nous and vous form. Elle veut que j'aie de bonnes notes. She wants me to have good marks. Il faut que tu aies du courage. Je veux qu'elle ait tout ce qu'elle désire. I want her to have everything she desires. Il faut que nous ayons des repas équilibrés. We must have balanced meals. Je veux que vous ayez tous votre exam. I want you all to pass your exam. Il faut qu'ils aient leur permis de conduire avant d'acheter une voiture. They must get their driving licence before buying a car. I thought exam was 'examen' in French? I thought 'tous' was pronounced 'too' unless it was used as a pronoun meaning 'all (of us/them)'. Is this correct? If so, why? It is used pronomially to refer to "vous". Merci Chris. Je ne l'ai pas su. C'est bon à savoir. Yes , the pronunciation of tous is correct and should sound the 's' . In your answer to Chris, it should be 'je ne le savais pas' as 'savoir' is a verb of state and you will hardly ever hear/see the passé composé used to say, 'I didn't know'. It's a mistake I often read on this forum from students so just to put things right! Merci Cécile, je ne le savais pas. Il faut qu'ils aient leur permis de conduire. They must get their driving licence. 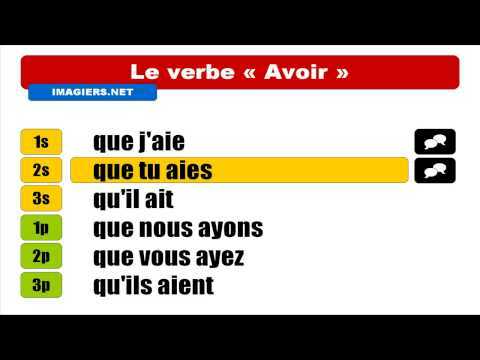 Avoir us used here similarly to "avoir un exam". Here it means they must 'obtain' their driver's license. But how would you say: "They must have their driver's license (with them)"? Context might be one way, but if 'they' was ambiguous, the imperative sentence would be ambiguous. They must have their driver's license (with them). Il faut qu'ils aient leur permis de conduire sur eux. Il faut qu'ils obtiennent leur permis de conduire. Is "avoir un exam" an idiom for passing an exam? Just wondering about the translation for one of the example sentences. I was thinking to pass the exam might be more like "Je veux que vous reussissiez tous votre examen?" and that the sentence above using avoir is referring to all taking or having exams? Merci pour l'aide ! In the case of exams, I find it more intuitive to think of "avoir" meaning "to get" rather than "to have", and the exam as a credential or certificate.